I am about to miss my fourth regatta this week. Thursday was the Unity Day race, and though I emailed my interest to several people at the club and told many more, there were no women’s boats from our club participating in Thursday’s 15 km. regatta. I was hoping that some rower would drop out at the last minute, and someone else would remember there’s that crazy American woman who wants to row this race, get her down here. But no such luck. I did, however, go to the party. I met my friend A at the Wannsee S-Bahn station and from there we walked the few blocks to the Berliner Ruder Club, the hosts of this event. They are one of two elite men’s clubs in the city, located on the Kleine Wannsee, just south of the bridge that separates the wild and woolly Wannsee from the narrow, more riverlike water. We arrived in time to watch the presentation of the silver cups to the winners. The winning team came from their own club, and the introductions went on for so long that it became clear they were highly decorated rowers with many international wins among them. I met many people that afternoon over beer and wurst on their veranda and boathouse grounds by the river. I could see open sores on the hands of the men who had rowed that morning, and I began to think I was perhaps fortunate to have missed out on the grueling race. 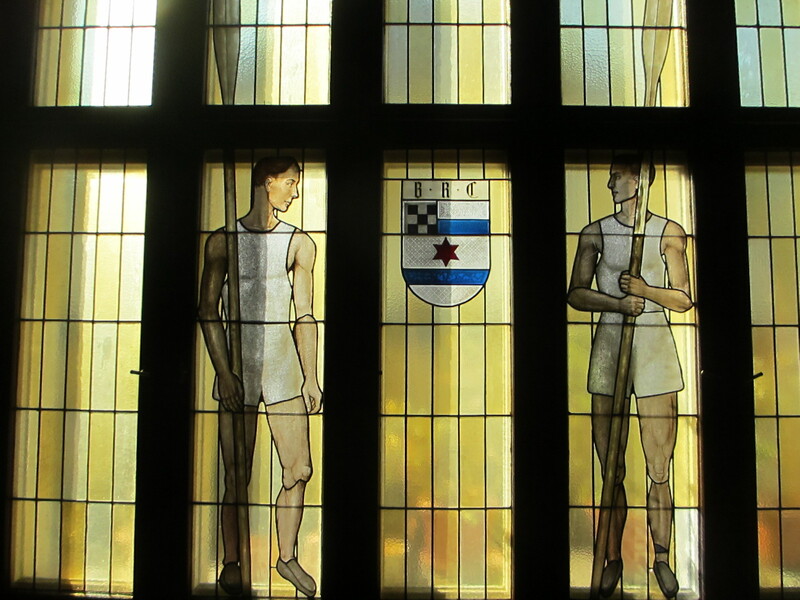 We took a look around the inside of the boathouse, which doesn’t feel like the right word for it because it’s more like an Ivy League hall, with dark paneled wood on the walls, leaded glass, leather chairs, and framed awards from past Olympics and other feats around the dining room. It’s a castle of sorts, and the boats are downstairs. Mostly I met people from my own club, people A knew who became friends of mine over the course of the afternoon, eased no doubt by the free-flowing beers that kept appearing. Through the day I learned a bit more about this men’s club, hearing once again that the club is conservative. “Why not?” I had to ask. Oh. That explains so much. If “boathouse” feels like the wrong word, perhaps “fraternity house” is more like it. He told me that a women’s club formed in reaction to them across the lake around 1912. But today they are a much smaller and less prominent club. Another man told me that our club, Ruderklub am Wannsee, has a board of directors made up of half men and half women. It wasn’t always like that, but the board made a deliberate effort to be inclusive. RaW used to be all men as well; women were allowed to join RaW in 1974. Helga, who coxed the first boat I rowed with RaW, had mentioned that she joined as soon as they let women in, and had been there ever since. She hasn’t raced since about 1994, but she continues to row and cox and take part in club life. All-club rows. Sport programs. A place for everyone, from novice to elite. For women and men. Male rowers who are appalled at the contempt for women shown by other clubs. I decided I like my adopted club very much, and we toasted my pending membership. Though I couldn’t talk my way into a boat for the Thursday race, I have had three separate offers to row in an octuple in the “Across Berlin” regatta along the Spree River taking place today, even as I write. I would drop just about anything to participate in this race—the one day a year when the river through the heart of Berlin is open to rowers. Alas, I cannot take part. We are flying to Paris this afternoon. It hurt to send my regrets three times to three different rowers, saying no to a regatta and a boat I want so much to be in. But I do realize that to say “unfortunately we will be in Paris that day” is sacrilege and I may be struck by a small bolt of lightning for the blasphemy. For the record, if I were back in Minnesota, I would have rowed in the Head of the Des Moines last weekend and the Head of the Mississippi tomorrow, the annual regatta my home club hosts. I feel as if I’ve struck a bargain with the Great Coach in the Sky: I’ll sit out four regattas this week if I can have just one pickup row on the Seine this Sunday. Deal. I’m calling it even. This entry was posted in Rowing and tagged Berlin, Berliner Ruder Club, regatta, Ruderklub am Wannsee, Wannsee on October 5, 2013 by Jill M.. It does sound exotic to be flying to Paris in the afternoon! Just not true that the BRC only wants young rowers…there exists a large part of the membership up into their 80s who row regularly and new ” middle-agers ” are becoming members all the time. Peter, thanks for your comment. Glad to hear BRC welcomes a broader spectrum of younger rowers than my friend thought. Maybe it’s helpful to know that there’s an impression out there among some 20-something male rowers (well, at least the ones I’m quoting) that they wouldn’t be welcome if they weren’t elite — suggesting a need to get the word out. I thought at first you were going to set the record straight on attitudes at the club towards female rowers. I only know what I heard in my limited exposure.